This article describes the indigenous knowledge (IK) that agro-pastoralists in larger Makueni District, Kenya hold and how they use it to monitor, mitigate and adapt to drought. It examines ways of integrating IK into formal monitoring, how to enhance its value and acceptability. Data was collected through target interviews, group discussions and questionnaires covering 127 households in eight villages. Daily rainfall data from 1961–2003 were analysed. Results show that agro-pastoralists hold IK on indicators of rainfall variability; they believe in IK efficacy and they rely on them. 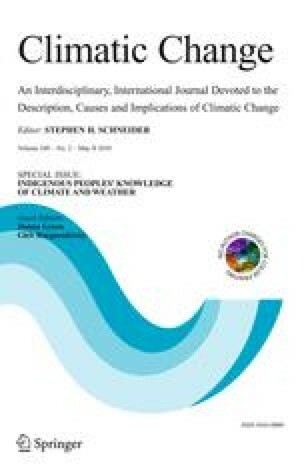 Because agro-pastoralists consult additional sources, the authors interpret that IK forms a basic knowledge frame within which agro-pastoralists position and interpret meteorological forecasts. Only a few agro-pastoralists adapt their practices in anticipation of IK-based forecasts partly due to the conditioning of the actors to the high rainfall variability characteristic of the area and partly due to lack of resources. Non-drought factors such as poverty, inadequate resources and lack of preparedness expose agro-pastoralists to drought impacts and limit their adaptive capacity. These factors need to be understood and effectively addressed to increase agro-pastoralists’ decision options and the influence of IK-based forecasts on their decision-making patterns. The limited intergenerational transfer of IK currently threatens its existence in the longer term. One way to ensure its continued existence and use is to integrate IK into the education curriculum and to link IK with formal climate change research through the participation of the local people. However, further studies are necessary to address the reliability and validity of the identified IK indicators of climate variability and change.